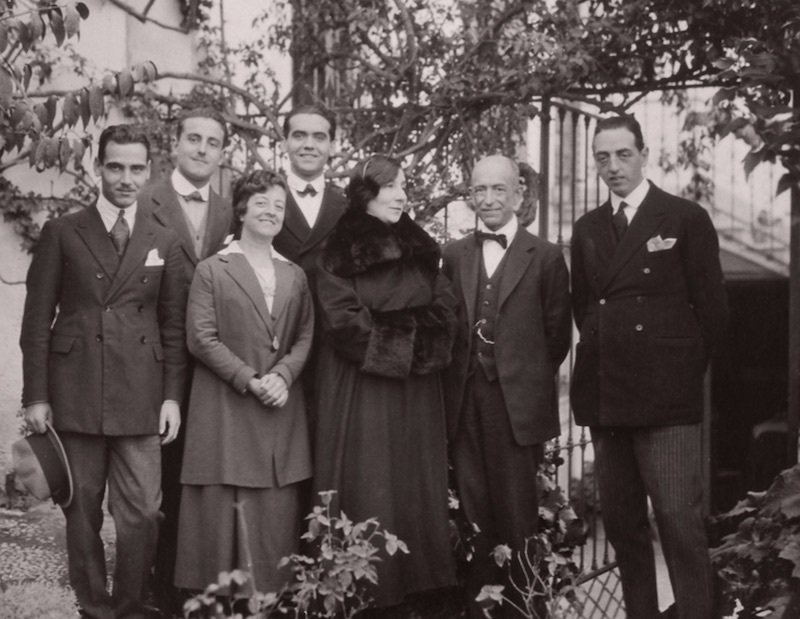 This blog’s ‘Then and Now‘ series demonstrates our enduring interest in places captured in time and their modern-day portrait; and so it continues as we stood outside the Granada home of Spanish composer, Manuel de Falla, born in Cádiz in 1876 (for a brief intro to his life, see bottom). The distant hum of traffic way below on the Paseo de la Bomba mixed with the sun-dried and brittle poplar leaves scuttling across the path leading to the entrance. And with the birds’ chatter overhead it fused into one ambient song. Apt, then, to be approaching the past residence of one of Spain’s most loved composers. 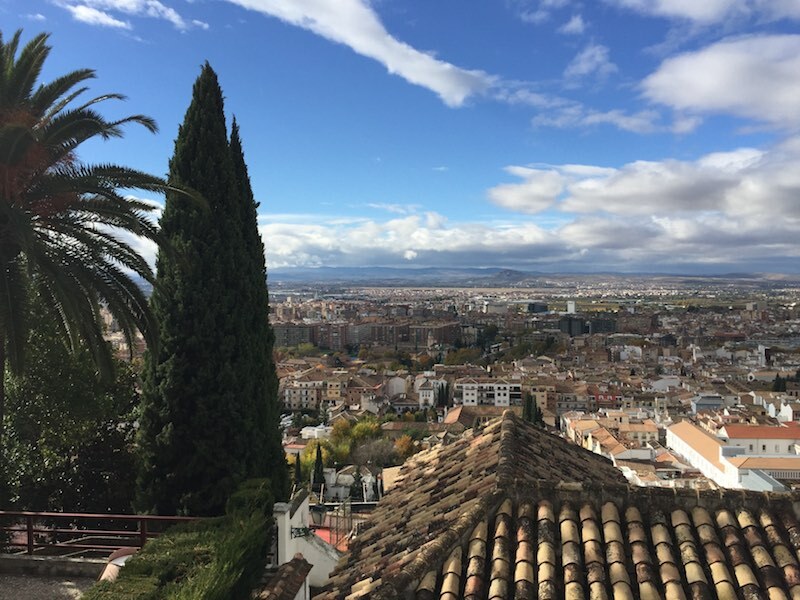 By his garden wall our gaze was drawn to the myriad rooftops of the city; the handsome spires of the Basílica de Nuestra Señora de Las Angustias, and the buildings that hug the Genil river. Looking south towards the borders of the city the land flattens out for miles before you glimpse the distant Parque Natural de las Sierras de Tejeda, Almijara y Alhama. What a view, and no wonder Falla chose this place to live. It wasn’t his first home in Granada, he left the first – the since-demolished Carmen de Santa Engracia on Real de la Alhambra – to escape the freezing winds that were funnelled down the street which made him ‘ill’. A hypochondriac, Falla believed there was an ailment around every street corner. We were yet to admire a ceramic water container that was once filled with pure mountain water (which he insisted on drinking) from the Sierra Nevada, the ever-present monolith topped with a blinding blanket of snow. So it was at the precise spot, Falla’s second home on Calle de Antequeruela Alta near the Alhambra, that we took a photo almost a century on from the gathering of Falla and acquaintances in November 1922, only without a sepia smile to be seen. A few steps further and we were ringing a bell as if to summon a butler in an Edwardian mansion. A tour guide appeared at the window, ushered us in and, with barely an introduction, we were off around the house on a whistle-stop tour. 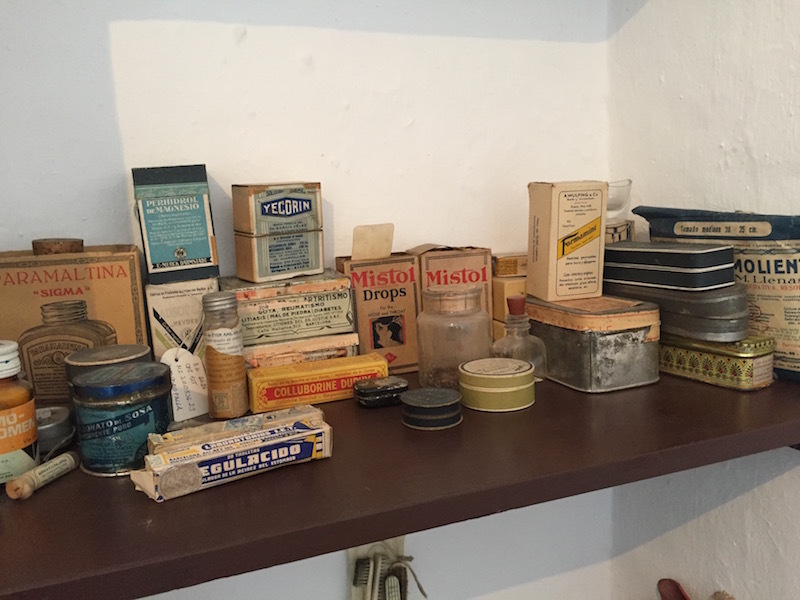 It was like visiting the home of an elderly uncle who’d recently died; their belongings on shelves…in cupboards. You could almost smell a tortilla cooking on the hob. But what makes this house so interesting is that it’s a reassembled time capsule of Falla’s time in Granada which lasted from 1920 to 1939. 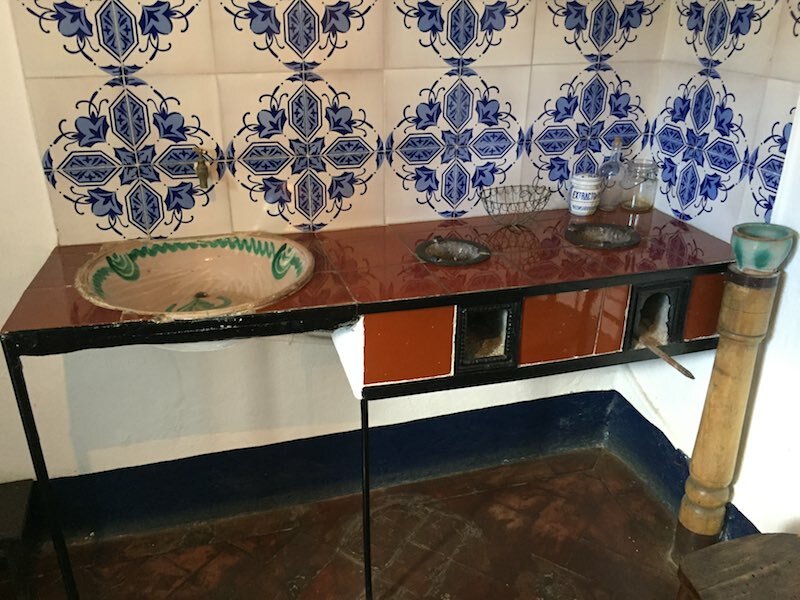 On moving in and unfazed about the house’s history – which included a murder of a father by his son who hid in the cellar before being found and hanged – Falla made some adjustments to the property including installing an internal staircase. As well as his parents’ furniture he bought locally-made items, many of which are still in the house. For such a hero (his ‘strangled turkey’ image made it onto the 100 peseta note in 1970) the house is relatively modest. The outside windows are painted in that gorgeous blue which adorns many houses in southern Spain; the interior a cool white and the perfect backdrop to the gems within – Picasso drawings, chestnut furniture, paintings, woven curtains from La Alpujarra (our neck of the woods) which cast subtle orange shapes across the walls. 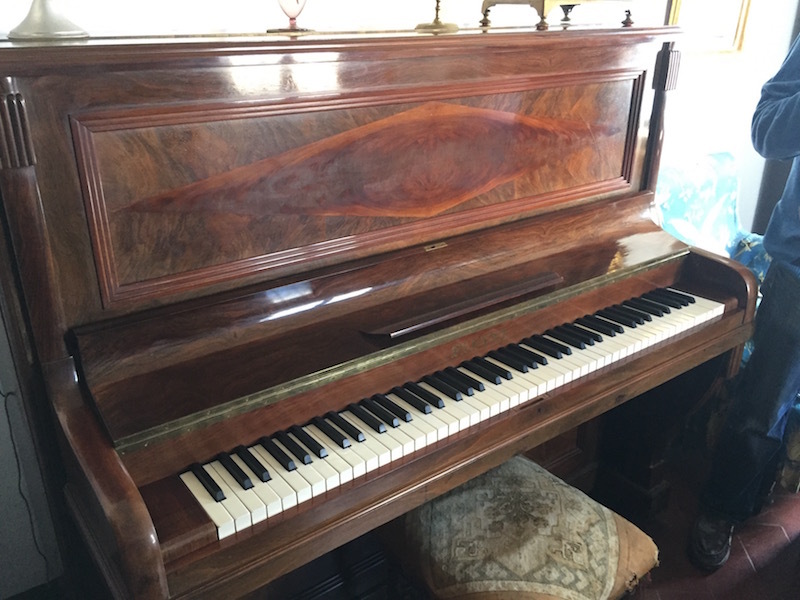 And of course his piano, pristine and polished. Our guide was friendly and knowledgeable, although preoccupied with his mobile as if awaiting directions for a first date rendezvous. He led the way like a school teacher who hates children – “they fight, they cry, they puke and I have to clear it up!” (luckily our breakfast stayed down; imagine being the first to chunder over the lower register of Falla’s piano). We learnt that he never married, lived here with his sister, Maria del Carmen, smoked like a chimenea (Player’s Navy Cut) and hid near the stairs to escape the bombs dropped from overhead during the Spanish Civil War. There was a gramophone, a crucifix Linda Blair would have been proud of, a basic bed with its original bedcover, and a shelf full of medicinal products. Piano aside, there was little to suggest this was a composer’s home; there were no original musical manuscripts on display, for example. After the Civil War had ended in 1939, and wanting to escape the Franco regime, he left for Argentina with his sister. Over the following years he continued to compose and also put on concerts. His house was left intact including his possessions. He told a friend: “Remember to look after my piano and keep it tuned”. Falla’s friends were to prove invaluable over the next few years. As well as looking after his house one sent him scores and books overseas until the house was burgled (in 1941) and silver cutlery stolen. Falla and his sister asked that their belongings were put in storage as a return to Spain seemed a way off. Another friend – wanting to preserve the ‘look’ of the house – made rudimentary drawings. 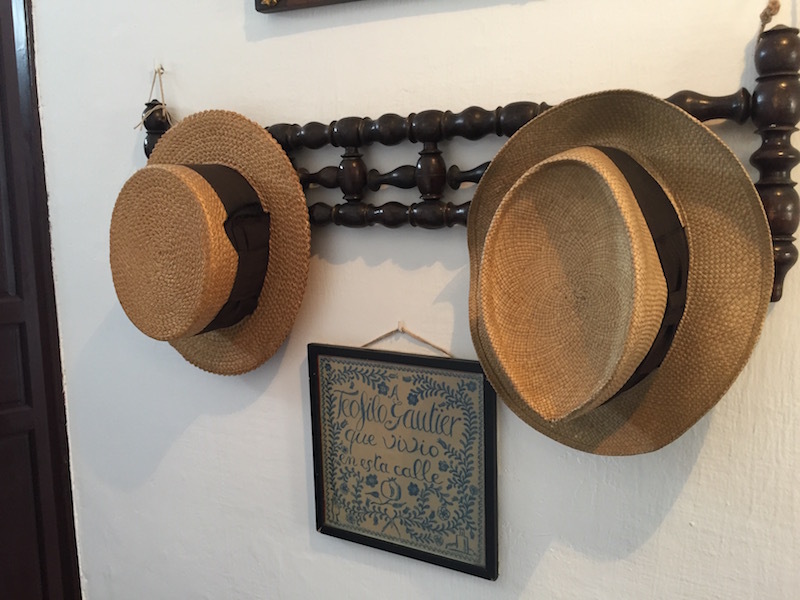 Now on display at the house, these were the seed of what was to become the museum and enabled the recreation of the house’s layout during the time Falla and his sister lived here. Falla was never to return to Spain. After his death the house was rented for many years until, in 1962, Granada’s City Council bought the property. After two decades, the possessions were brought back. Falla’s elderly sister, Maria del Carmen, returned to live there for periods in the 1960s. How lovely for her, but perhaps a little sad too; her beloved cats – and brother – long gone. In 1965 the house opened to the public as a museum. The furniture, using the drawings from years earlier, was put back in the same locations as before (although a few changes to the house had been made since his departure). Work had already been underway for many years to collate and house archive material relating to Falla – from letters, manuscripts and even electricity bills – under one roof. In 1991 the Archivo Manuel de Falla opened in Granada, a stone’s throw away from the house. The issue with visiting places like this is that you secretly hope that the owner would jump out of a cupboard wearing an ill-fitting suit yelling “Surprise!” so they could show you their favourite bowl themselves. But no, the closest you’ll get to Falla is visiting the cathedral in Cádiz where his remains now are, brought back from Argentina after his death from a heart attack in 1946. But in this small, charming house, closeted from the outside world, he was there in spirit, offering a glass of local wine, and possibly a cigarette, to his guests. Years ago, M (of this parish), enjoyed a musical dalliance with a singer raised on opera in the heat of a vast continent. Below is their recording of Falla’s ‘Asturiana‘ from his Siete Canciones Populares Espanolas (Seven Spanish Folksongs). M’s contribution, ugly and error-ridden, is omitted but the vocal track – isolated from the overall recording – is here. 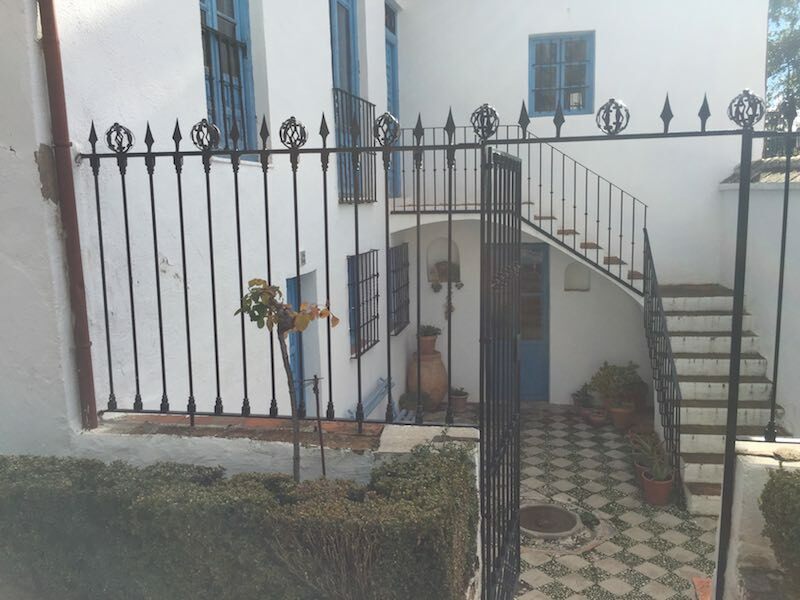 This post is less about his life (you read more here) and more about his home in the years he spent in Granada – but a little background is needed. Born in Cádiz in 1876 he was exposed to music from an early age; his mother was musical and the family’s maid – who was of of Moorish descent – sang him traditional ballads, often while dancing. He learnt the piano and on moving to Madrid in 1900 studied composition. It was while in Madrid that he became interested in Andalusian music, in particular, flamenco. In 1907 he moved to Paris where he met Ravel, Debussy and Stravinsky (all influences on him) before moving back to Madrid soon after the outbreak of the First World War. 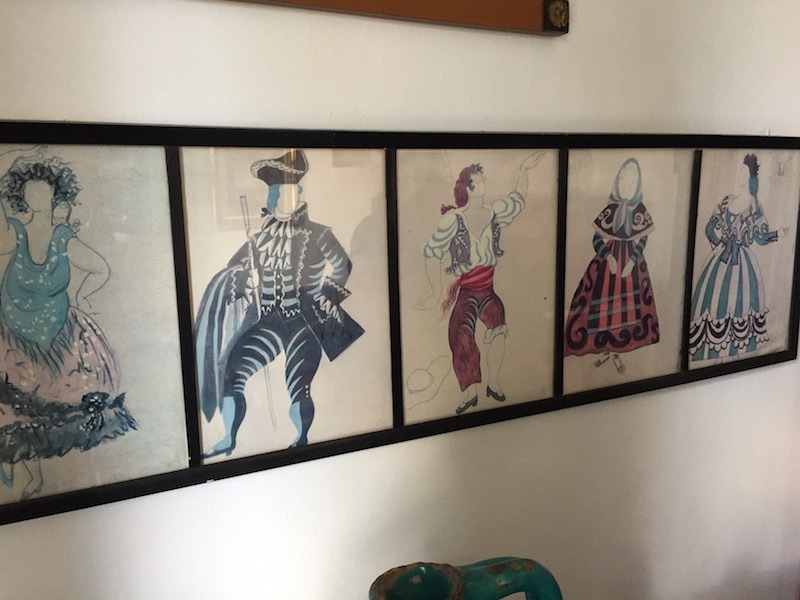 It was then he produced arguably some of him most famous work including the ballets El amor brujo (The Bewitched Love) and El sombrero de tres picos (The Three-Cornered Hat). After Madrid he moved to Granada in 1920. Fascinating info – and great images.